K C Das Commerce College Recruitment 2018 | Assistant Professor in Economics :- Good news for candidates who have done Masters in economics. K C Das Commerce College has published a recruitment notification in the month of August 2018 for filling up assistant professor vacancy in Economics. According to the Latest K C Das Commerce College Recruitment 2018 August, Applications are invited with all supporting documents for the post of Assistant Professor (Contractual) in Economics as per UGC norms. 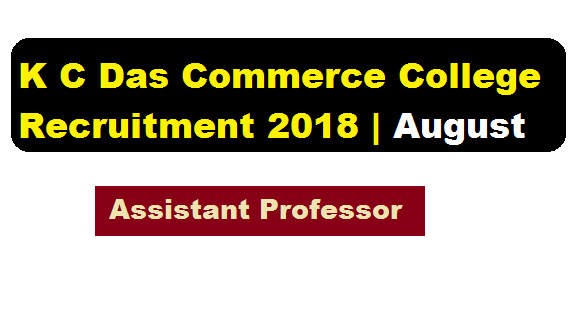 In this section, we will discuss in detail about Recruitment of Assistant Professor posts under K C Das Commerce College Recruitment 2018 August with all the details and requirement. Salary : May be Negotiable. Application should be sent / submitted to the Principal & Secretary, K.C. Das Commerce College within 15 (fifteen) days from the date of publication [07/08/2018] of this advertisement, along with a Demand Draft of Rs. 500/- (Rupees five hundred) only drawn in favour of Principal, K.C. Das Commerce College payable at Indian Bank, Athgaon Branch, Guwahati. a) Eligible candidates will be informed about the date of interview in due course of time. b) No TA/DA will be paid to the candidates called for the interview.